Check out these photos from our first grantee event! Home / Giving Circle News / Cary Women's Giving Network News / Check out these photos from our first grantee event! Panel discussion from our first grantee event held earlier this year. Photo from the Cary Women’s Giving Network grants event held earlier this year. 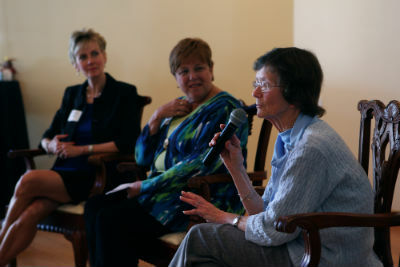 Left-to-right: Kay Struffolino, community volunteer; Deirdre Jersey, capital campaign coordinator for Dorcas Ministries; and Virginia Anthony, member of the Cary Women’s Giving Network and the Cary Community Foundation. Photo by Andrew Kenney and used with permission of the Cary News. Some of our Network members and grantees at our first event. L-R: Sarah Perkins, grants chair, Cary Women's Giving Network and also board of advisors, Cary Community Foundation; Jennifer Robinson, Cary WGN co-chair and board member, CCF; Alyssa Benfield, CORRAL; Pat Lykins, the Carying Place; Jill Straight, Dorcas Ministries; Sheila Ogle, Cary WGN co-chair and board member, CCF.